June 2019 sees the 75th anniversary of one of the most important and decisive battles of World War II – D-Day. Next year, head to Normandy to immerse yourself in the history of World War II and visit both the British and American sectors. Accompanied by a knowledgeable battlefield guide, experience the beaches and battlegrounds of the invasion that turned the tide of the war. Although the horrendous conditions are difficult to imagine, the guide brings the experiences of these brave men to life. Visit cemeteries and museums about the D-Day invasion. The popular Arromanches 360° Circular Cinema, screens archival footage of the Battle of Normandy. Additionally, discover the battles from the skies at the Airborne Museum, which tells the stories of American paratroopers. Explore why and how the battles were fought, and gain varied perspective. Visit the memorials and understand the extraordinary deeds and astonishing sacrifices made. With this milestone anniversary of this most significant part of our history, it is the perfect opportunity to visit the site of battles in Normandy and reflect. Sail from Portsmouth across the English Channel to Caen with Brittany Ferries. On arrival into the Norman port, you may glimpse some of the first beaches of the battles and as you travel into Caen drive alongside the famous canal that had to be secured. Check in to your hotel. If time allows, have a wander around the beautiful town. We start the day with a visit to Pegasus Bridge, Café Gondré and the Pegasus Memorial Museum, which is dedicated to the men of the 6th Airborne Division. 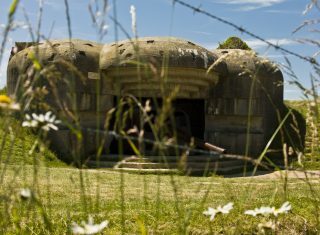 Then head to Merville Gun Battery, one of the first places to be attacked on D-Day. We proceed to Ranville Commonwealth Cemetery, the final resting place of 2,562 brave servicemen, and Bréville Ridge. We stop for lunch in the quaint port town Ouistreham, and in the afternoon, we drive along Sword, Juno and Gold Landing Beaches. The taking of these beaches was the responsibility of the British and Canadian Armies. We make a final stop in Arromanches to visit the invasion museum, focusing on the amazing Mulberry floating port. First, we travel to Sainte Mère Église, the scene of some of the tragic landings of the US paras, before visiting Azeville Battery and Airborne Museum. The Airborne Museum is dedicated to the memory of the 82nd and 101st airborne divisions. The collection includes a WACO glider and C-47 cargo plane. 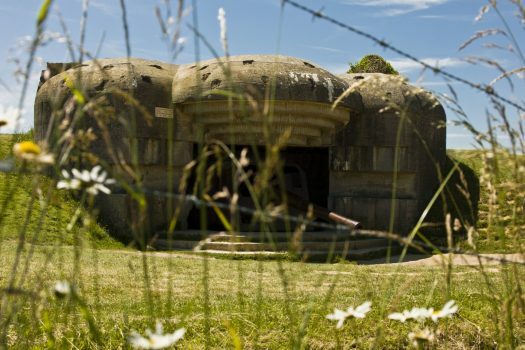 See Utah Beach then head to Pointe Du Hoc, which was captured by the American Rangers. Next we visit the American Cemetery overlooking tragic Omaha Beach, which is the resting place of 9,387 souls. We also visit the beach itself. We continue along the beach to the Longues-Sur-Mer Gun Battery, with its original guns. Today, we travel to Bayeux to visit the historic famous Tapestry which tells the story of William the Conqueror invasion of England from 1064-1066 and his crowing as King. 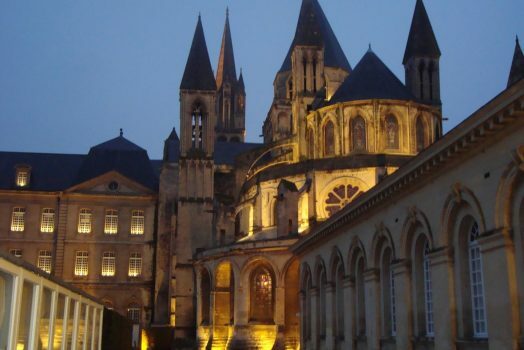 Bayeux Cathedral is also worth a visit with its different architectural styles. If you didn’t visit yesterday, an alternative is to visit the nearby Commonwealth War Graves Cemetery with over 4,000 buried there. Check out of your hotel and make your way back to the port. Time permitting, enjoy some final sightseeing in Caen before departing. 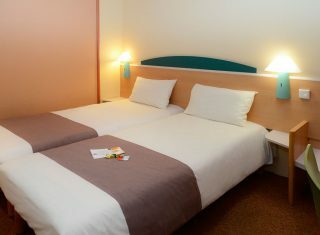 3* hotel located 15km from Caen airport. There is a garden, terrace, 24 hour reception, parking for 2 coaches and onsite restaurant and car. Free WiFi is also available. Rooms are ensuite with WiFi, TV and telephone. 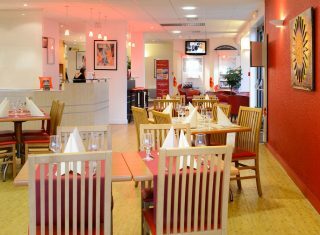 We have a range of alternative hotels to suit all budgets and tastes in the area. Fancy a different historical tour? Or something different in France? PLEASE NOTE: If travelling with Brittany Ferries, Friday afternoon to Monday morning tours are not possible on certain weeks of the year due to sailing schedules. If you have preferred dates, please contact us and we will be pleased to check the schedules. Depart from your local area and travel to Normandy by coach. 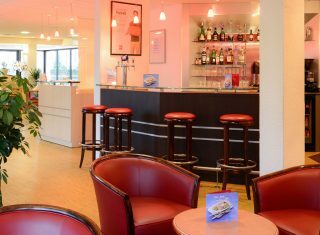 Sail directly into the Norman port of Caen (Ouistreham) with Brittany Ferries. Day and overnight sailings are available (depending on schedule). Sailings into St Malo or Cherbourg are also possible. Alternatively, we can arrange short-sea Dover-Calais / Dunkirk ferry crossings or Eurotunnel crossings from Folkestone-Calais. We can also arrange overnight stops in northern France if required.